Towering oaks, hickories, and beech trees, some hundreds of years old, rise from the sand and create a canopy of trees more typical of the mountains of the eastern United States. Over 100 species of birds have been documented at Nags Head Woods and over 50 bird species nest here. Fifteen species of amphibians and 28 species of reptiles have been documented as well. The freshwater ponds are inhabited by seven species of fish and many reptiles and amphibians in addition to a great diversity of floating aquatic plant life, including the rare water violet. 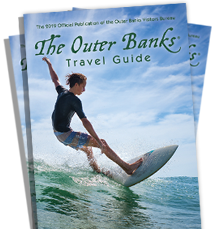 The Preserve also hosts rich Outer Banks cultural history. During the 19th century and through the 1930s, Nags Head Woods was a thriving village community with 13 homesites, two churches, a school, a store, farms, a gristmill and a shingle factory. There are artifacts remaining of village life: a home foundation, cemeteries and other signs of previous human habitation in the forest. To safeguard the sensitive diversity and history of the Preserve, trails are for foot traffic only. Dogs, bicycles and horses are welcome on the gravel roadway, but not on the trails. Be safe on the trails and know your limits. Wear appropriate clothing and shoes; take a trail map and water with you on the hike; in warmer months bring along some insect repellent.